When his family moves to a new neighborhood, he suddenly finds that he’s the only Chinese-American student at his school. Jocks and bullies pick on him constantly, and he has hardly any friends. Then, to make matters worse, he falls in love with an all-American girl. Born to rule over all the monkeys in the world, the story of the Monkey King is one of the oldest and greatest Chinese fables. Adored by his subjects, master of the arts of kung-fu, he is the most powerful monkey on earth. But the Monkey King doesn’t want to be a monkey. He wants to be hailed as a god. Chin-Kee is the ultimate negative Chinese stereotype, and he’s ruining his cousin Danny’s life. Danny’s a basketball player, a popular kid at school, but every year Chin-Kee comes to visit, and every year Danny has to transfer to a new school to escape the shame. This year, though, things quickly go from bad to worse. The art itself is simple enough to lure in the kiddies right from the start, without ever becoming too simple or failing to convey the storyline. In the end, this book is one of the subtler discussions of race, racism, and trying to fit in. 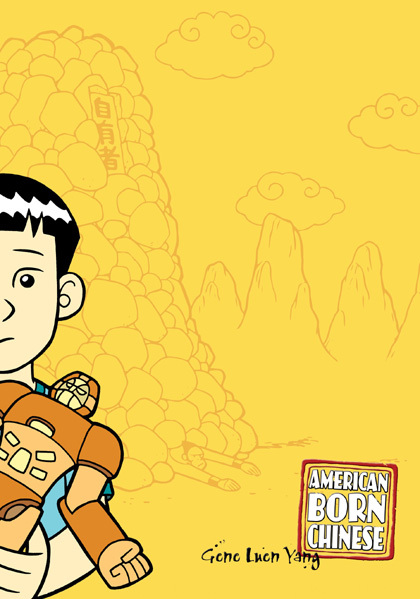 Fellow author Derek Kirk Kim is blurbed as saying, “As an Asian American, American Born Chinese is the book I’ve been waiting for all my life." The book goes beyond just the Asian American community, though. It’s a smart witty treatise that needs to be read and understood by all kids. The best graphic novel of 2006 for children, bar none.